Comte de Rochambeau was the leader of the French army sent from France to aid the Americans and their fight for independence (1). 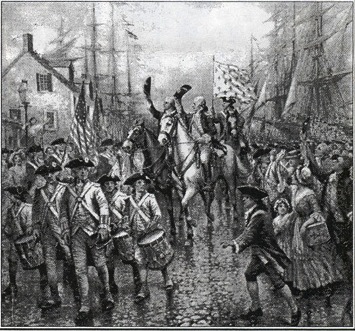 In 1780, Rochambeau arrived in Newport, Rhode Island with 5,500 men (2). The foreign aid from France for America did not sit well with Great Britain. The British plotted to ambush Comte de Rochambeau and his troops in Newport, Rhode Island. However, the Culper Ring gained sensitive knowledge about the British plot to attack the French troops. Benjamin Tallmadge warned George Washington of the attack (4). Without the Culper Rings' interception and warning, the French troops would have been attacked without notice or preparation. 1. National Park Service U.S. Department of the Interior, "Comte de Rochambeau," National Park Service (Accessed April 26, 2016), https://www.nps.gov. 3. Charles Wilson Peale. Portrait of Comte de Rochambeau.